My mother-in-law was a great cook. This is my version of a salad that she used to make that I absolutely loved, but I've not been able to make the dressing like she did. So, I changed it a bit and it worked great! My MIL was a very frugal shopper and cook, but she always made well balanced meals. 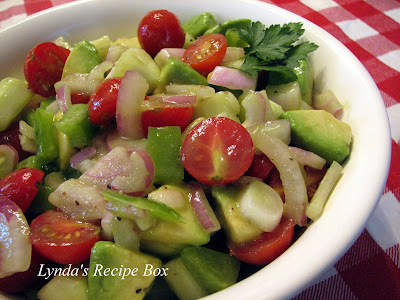 This salad was a favorite in the summer when the tomatoes and cucumbers were ready in her garden. She cut all the veggies very thin and used more dressing, but I have cut these in a large dice and used minimal dressing. The result is a very delicious salad with crisp vegetables, creamy avocado and a simple, tangy dressing. This salad dresses up any summer meal. I've made a small salad here, as the avocados won't keep well, so you will need to double it for a larger group. However, I kept eating this after I made it and now there's not much left! I'll have to make more of this delicious and healthy salad! Put all veggies and avocado in a bowl. Make dressing. Mix well and pour over salad. Stir lightly with a wooden spoon so you won't tear up the avocado. Best served the day it's made. The dressing may seem too tangy if you taste it before adding it to the salad, but it mellows out after it is stirred into the veggies. Enjoy! This is a very healthy and colorful salad! It looks yummy too!! love your recipes! keep them coming! I have a plethora of cucumbers I need to use and this looks like just the thing! What a fresh looking salad! This looks so refreshing! Great idea! Bookmarked! This look absolutely perfect. Lynda, all my favorite salad ingredients are in here. I LOVE this! I agree with Katy--all of my favorite salad ingredients with the added bonus of avocado...how can you go wrong?!? I love the colors!!! A grand salad! Fresh and summery and will make it! Thank-you. This is about as perfect as a salad can get. The words delectable and refreshing come to mind. I really love the color and clarity of your pictures. 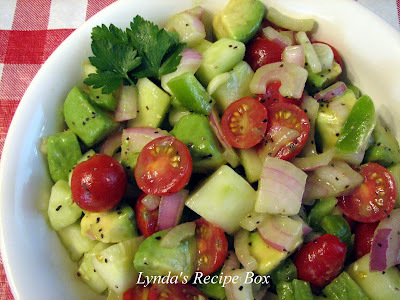 well, what a coincidence--avocado, cucumber, and tomatoes are three of my favorite summer foods. light, bright, refreshing, and healthy--i love it. Oh, what a great Summer meal, with a hunk of bread and a few slices of good cheese, mmmmm! I love everything in that salad!!! what a gorgeous colorful salad - love it! That looks absolutely fabulous! So colorful and refreshing. I'm sure your MIL would have approved! WOW looks super healthy and light. Now I wish I had planted cherry tomatoes. The salad sounds wonderful! Wish I had found this sooner! Adding it to my file as a fun, pure side dish that my "normal" (not gluten- and dairy-free) friends would enjoy! Thanks. I know this is an old recipe but it is just what I want for lunch, tomorrow. I just pinned it.